At Travel Money, it only takes ten minutes to have you out the door and ready to go with a Mastercard Cash Passport. Enjoy the freedom of traveling the world with just one card. Eat, shop or play wherever Mastercard® is accepted or withdraw from ATMs along the way, just as you would with your bank card at home. Quicker than cash, contactless payments can save you time when tapping with Cash Passport. Get internet access via millions of Boingo hotspots globally. Get 3 months’ Boingo membership every time you top up your Cash Passport with $100 AUD or foreign currency equivalent. Transfer instantly, from your Cash Passport to another Cash Passport issued in Australia or New Zealand in available currencies. 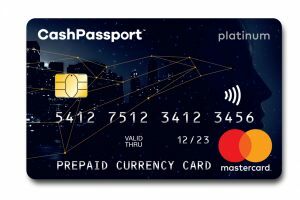 Cash Passport can be purchased in store. Just be sure to have your Australian driver’s license or passport ready. Once you have a Cash Passport, you won’t look back. Initial load fee $0 foreign load fee. 1% when loading AUD. Maximum load amount: $100 000 p.a.